This is a very easy but classy fruit salad — perfect for the holidays. Whisk orange juice and honey together — set aside. 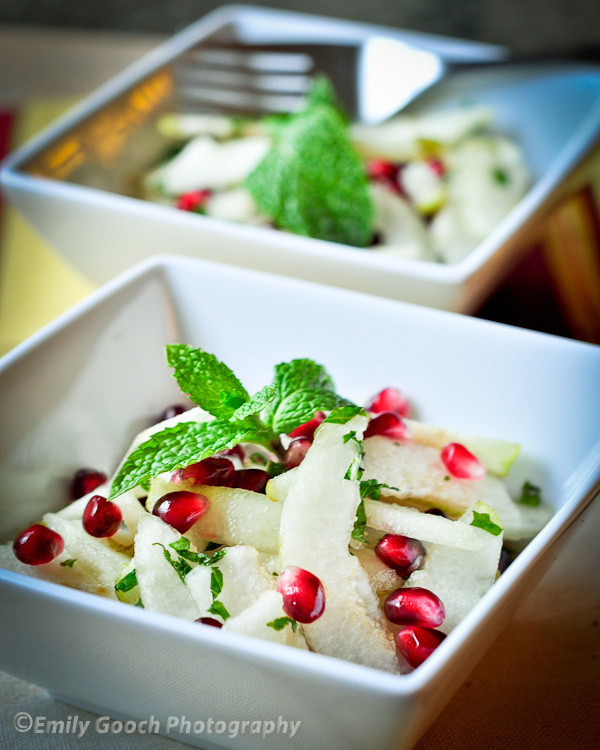 In a mixing bowl: combine pear slices, pomegranate seeds, and chopped mint leaves. Add orange honey dressing just before serving. Gently, toss all ingredients until the fruits are well coated. *For this recipe, I used the Chinese Fragrant Pear. It’s crisp and juicy and not too sweet. However, you can use any variety of Asian pear. All photographs, recipes, stories, etc... belong to Foodie With Camera, unless otherwise noted. I do hope you like what you see and would be happy to have you use my work -- however, please respect the copyright law and email me, if you want to use any of the recipes for more than just personal or to download any of the photographs.